Aurivo is a global food and nutrition business with four distinct divisions: Consumer Foods, Dairy Ingredients, Agribusiness and Marts. At Aurivo, we take the protection of your data seriously. We want you to feel confident that we are keeping your data secure and that we process it in accordance with our legal obligations. This policy sets out the basis on which any personal data we collect from you, or that you provide to us, will be processed by us. Please read the following carefully to understand our practices regarding your personal data and how we will treat it. We are Aurivo Co-operative Society Limited (“Aurivo”), we are a co-operative registered under the Independent and Provident Societies with the Registrar of Friendly Societies under registration number 5113R. 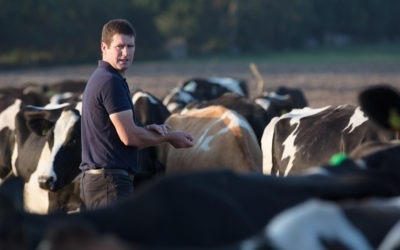 We have a number of wholly owned subsidiaries and a few partly owned subsidiaries. Our head office is located in Finisklin Business Park, Finisklin, Sligo. For the purpose of the Data Protection Acts 1988 and 2003 (as amended) (the Acts) and from 25 May 2018, the General Data Protection Regulation (the GDPR), the data controller is Aurivo. The types of personal information that we collect and process includes your name, address, contact details and other information necessary to provide you with our products, services or shareholding. If you use any Aurivo website or app you will need to share certain personal information with us, such as your name, phone number and email address, and to create a unique password for your account. Your marketing preferences that you provide when you sign up for our rewards card. We collect the information in order to provide you with our products and services, to market our services and products, to improve our website and to recruit staff. To deliver information by text message about our products and services, where you have subscribed to receive same. We will only share your Personal Data with wholly owned subsidiaries & third parties who have entered into a Data Processing Agreement in line with their confidentiality obligations. Third party service providers processing personal data on Aurivo’s behalf, for example to host, manage and service our data as well as administering certain services and features. When using third party service providers we enter into agreements that require them to implement appropriate technical and organizational measures to protect your personal data. We use a variety of technical and organisational security measures to maintain the safety of your personal data. This depends on the type of data and how we use it. When we make a decision on what data to keep we consider the information we need to best provide you with our products and services, to help us manage your relationship with us, and to make sure we can meet certain statutory obligations. We are legally obliged to process your information in order to comply with regulations. WHAT ARE THE IMPLICATIONS OF NOT PROVIDING INFORMATION TO US? Sharing information with us is often a necessity to ensure we can provide our services to you, you can choose not to share information with us, but doing so may limit the products/services we are able to provide to you. DO WE PROCESS YOUR INFORMATION OUTSIDE THE EEA? Presently, we do not transfer your information outside the European Union or EEA, however if our service providers change or relocate outside the EEA safeguards will be put in place to protect your information. To withdraw that consent at any time, where any processing is based on consent. If you feel that the processing of your Personal Data is not in line with our data protection obligations, you can make a complaint with the Data Protection Commissioner (DPC). If you have a rewards card, you can opt-out of receiving Aurivo’s marketing communications by signing into your rewards card account section of our Homeland.ie website. You can also opt-out by modifying your email or SMS subscriptions by clicking on the unsubscribe link or following the opt-out instructions included in the message. Cookies are small files that are stored on your computer when you visit our websites. The cookies hold basic information that shows us if you have visited our site previously, and which pages you visited. This data helps us to provide you with a more personalised service, so for example, the next time you visit our site we can present you with product or service information that you’ve shown an interest in. We use traffic log cookies to identify which pages are being used. This helps us analyse information about web page traffic and improve our website in order to tailor it to customer needs. We only use this information for statistical analysis purposes and then the information is removed from the system. Overall, cookies help us provide you with a better website, by enabling us to monitor which pages you find useful and which you do not. A cookie does not in any way give us access to your computer or any information about you, other than the information you choose to share with us. Today most web browsers allow you some control over whether you allow cookies to be collected. You can also easily delete or clear cookies on your browser at any time. Get in touch if you have any questions about this policy, your Personal Data or to exercise your rights as mentioned above. We may need to change this notice from time to time, any changes will be posted on our site and will be effective when posted. To keep up to date please review this notice each time you use our site or services. 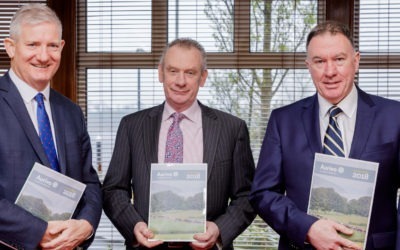 Robust performance in 2018 aligned with the deployment of key investments to solidify and underpin future performance. 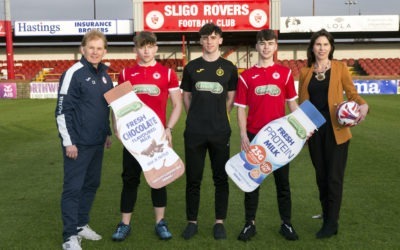 The Aurivo Co-Op Consumer Foods brand, Connacht Gold, has announced its continued support for Sligo Rovers as part of its ongoing sponsorship of the Bit O’Red Under 19 side. Address: Crossmolina Rd, Ballina, Co Mayo. Sat: 9am - 4.45pm. Closed Wed. Address: Moydrum Business Park, Cavan Exit, Main Dublin Road, Athlone. Address: The Quay, Killala, Co Mayo. Address: Castletown, Easkey, Co Sligo. Address: Carrick on Shannon, Co Leitrim.